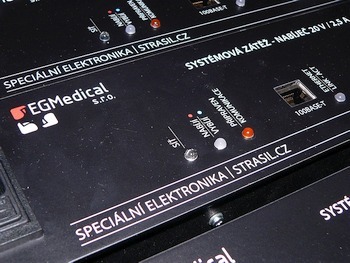 EGMedical, Ltd. offers custom hardware, firmware and software design services based in Brno, Czech Republic, EU. We are specialized in development of high quality medical, measurement and control devices, with emphasis on IoT and Industry 4.0 technologies. 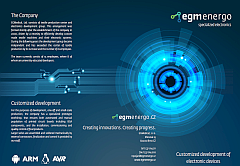 EGMedical, Ltd. consists of textile production center and electronics development group. This arrangement was formed shortly after the establishment of the company in 2000, driven by a necesity to efficiently develop custom made textile machines and their electronic systems. 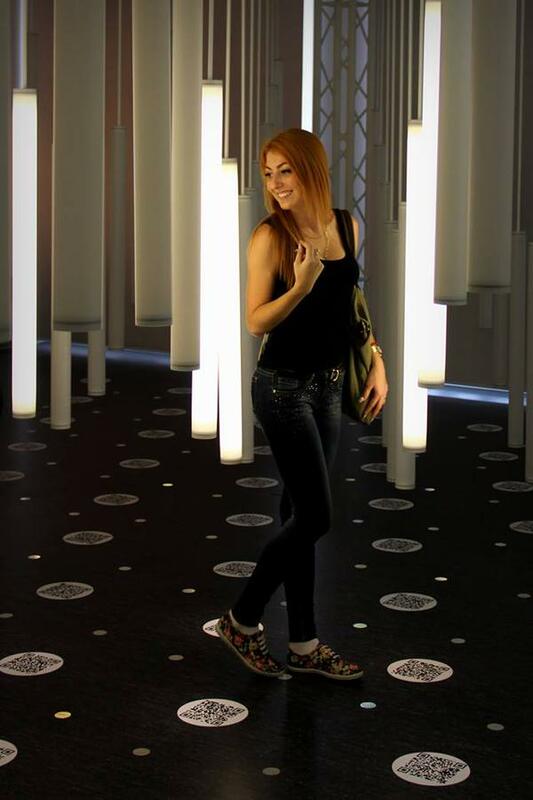 During the following years the development group became independent and has exceeded the center of textile production by its turnover and the number of its employees. The development team currently consits of 15 developers + support staff. 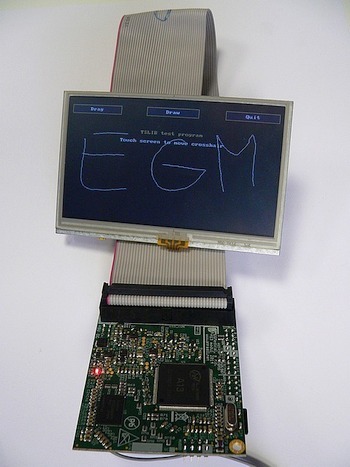 Our designs are usually either microcontroller based (8-bit AVR or 32-bit ARM microcontrollers (STM, NXP), sometimes with supporting high-speed FPGA logic) or Linux based, using our own SoM modules or commercially available SBCs for smaller quantities. 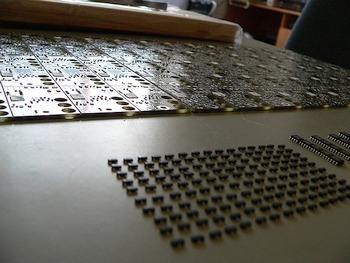 For the purposes of development, one-off and small-scale production, the company has a specialized prototype workshop, that ensures both automated and manual population of printed circuit boards including BGA components, and the installation, commissioning and quality control of final products. Large series (> 100 pcs/month) are assembled and soldered mechanically by external contractors, finalization and control is provided by our staff. 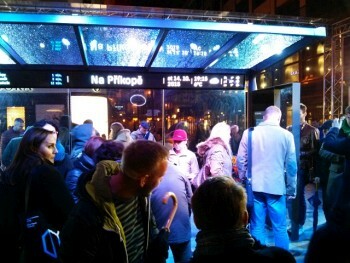 Complex electronic equipment for smart bus stop, consisting of nearly four meters long color RGB LED display on top of the shelter, a pair of interactive touch screens inside the advertising light box and a spot for mobile phones charging via cable or wireless Qi standard. 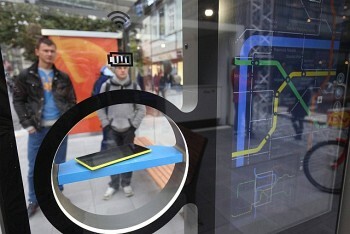 The system includes a Wi-Fi hotspot. 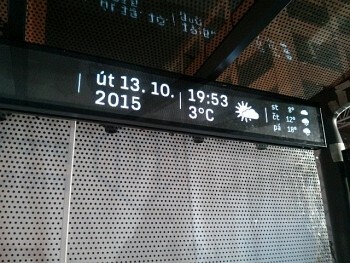 Horizontal panel displays information about departures, traffic reports, outside temperature, weather forecast, time and date. 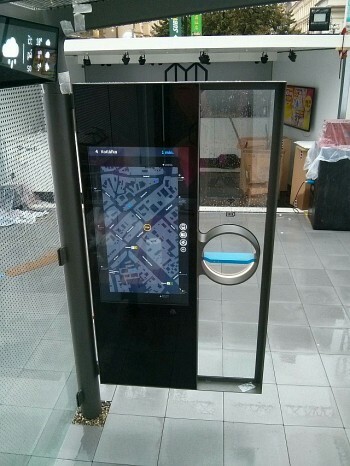 Besides the actual departures and complete timetables, the side panels allow you to see maps and other information. 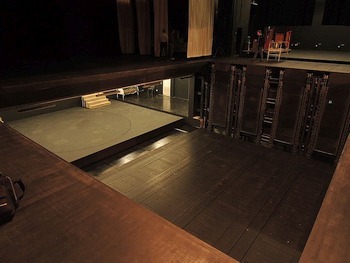 The shelter itself was made by the company Mmcité, a major street furniture designer and manufacturer. 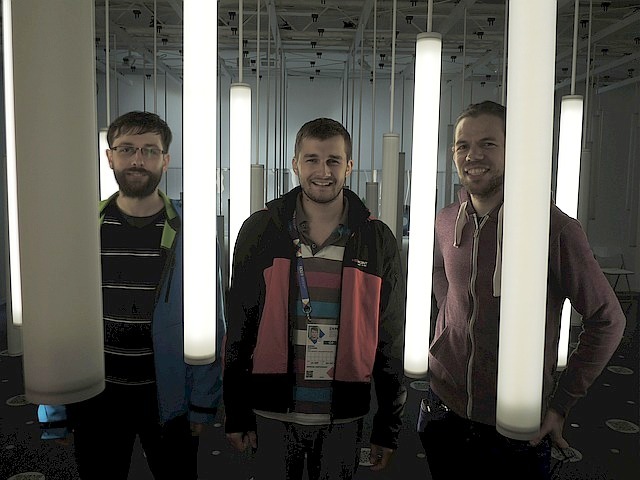 Graphic design of the signage displays was created by Marvil, and the authors of the project are Eduard Herrmann and Matěj Coufal. 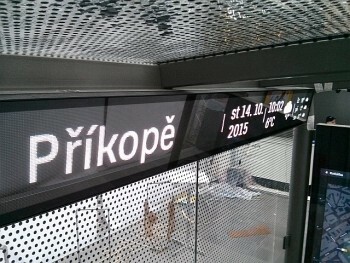 The Designblok 2015 exhibition report by Czech Television. 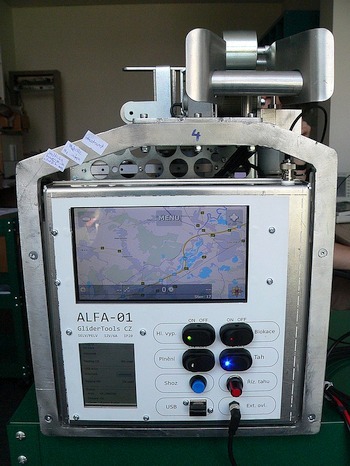 The electronic system for controlling air-dropped wildlife rabies vaccination. 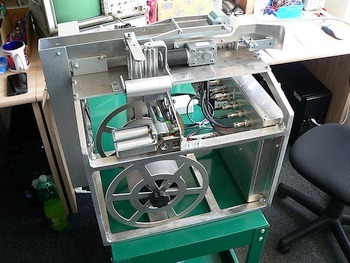 Gradually two versions of the device were developed (dispenser and registration device). The device provides automatic vaccines dropping while flying over the target area. 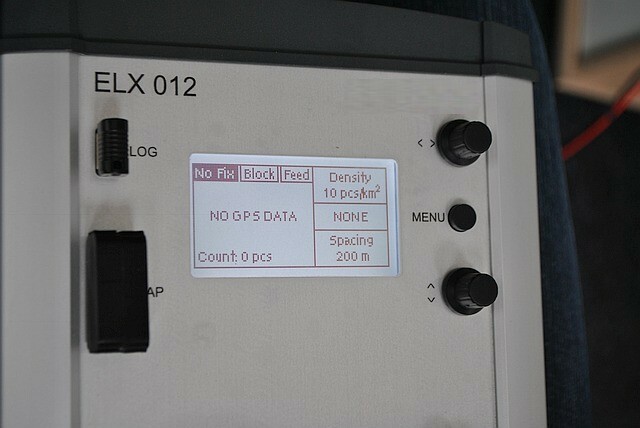 The device, based on OS Linux, integrates dispenser control driven by GPS data, maps of prohibited areas and required density dosage of vaccine baits. 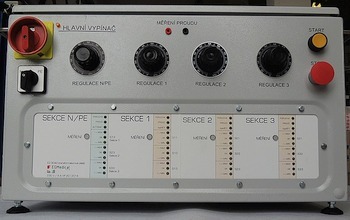 Vaccination progress is recorded on the media and can be re-analyzed: the system is equipped with a dual logging of executed operations. Control and display is made simple so that the device can be easily controlled during flight from the local panel or by remote control. 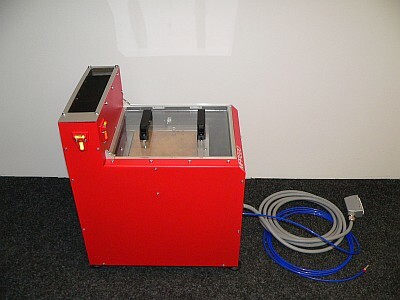 The actual operation of the dispenser is described as follows: The feeder is continuously pulling a tape with vaccine baits into the cooling tunnel (optional). 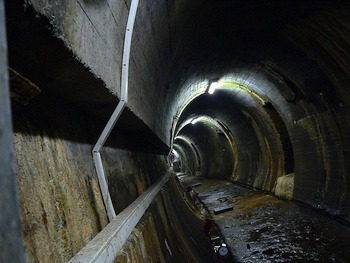 At the beginning of the tunnel the tape wrapping is cut and directed onto the spool reel. The vaccine itself travels through the cooling tunnel where it is kept at low temperature until it reaches the container. From the reservoir, vaccines are discharged automatically or manually. 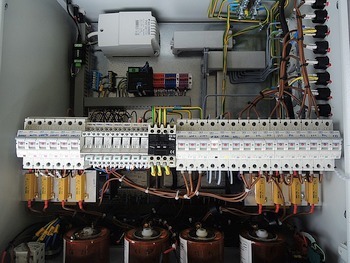 Management of public lighting for the 21st Century: The device consists of a complex control unit for street lighting switchboard: it merges functions of astro timer, control of voltage regulator, and the four-channel power meter able to recognize street light or power line failure. The system can be remotely controlled via LAN or GSM. 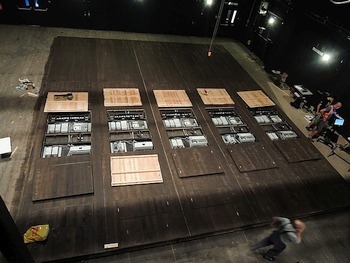 Electronic equipment for battery-powered side wagons for the New Stage of J.K.Tyl Theatre in Pilsen. 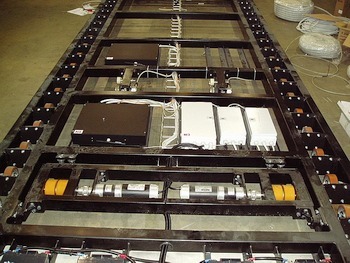 Our technology controls the side wagons' engines and speed and controls their exact location using ARC sensors, that are calibrated with coded magnetic sensors. 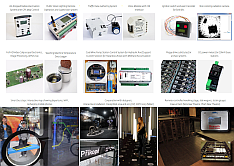 Everything is controlled wirelessly via MODBUS / TCP and Profisafe. 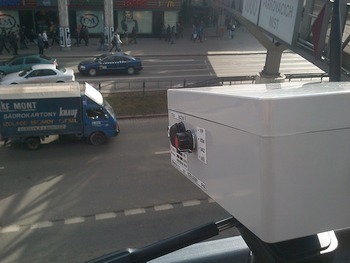 Development of a device for measuring the intensity of traffic and conducting transportation studies - counting passing vehicles including vehicle classification by size and velocity and radar measurement of speed of individual vehicles, alternatively measurements in multiple directions or lanes using FMCW radar and other types of sensors, including laser ones. 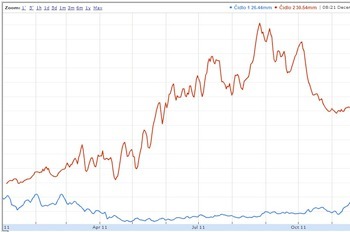 Information about the passage of vehicles is downloaded to a computer and processed using sophisticated software to various indicators of the intensity of traffic, including some innovative metrics. 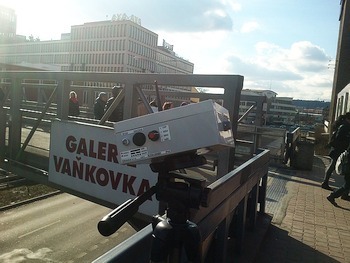 The equipment also enables online data transfer via Wi-Fi and manual timestamps recording using the wireless controller. 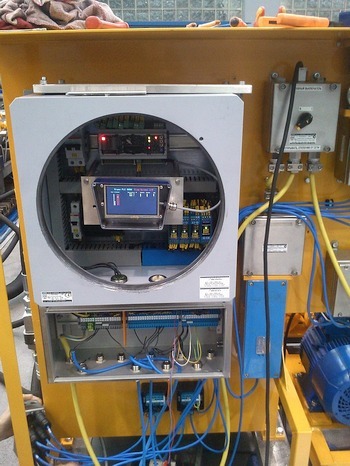 Control system for pressure station of hydraulic supports in an underground mine. 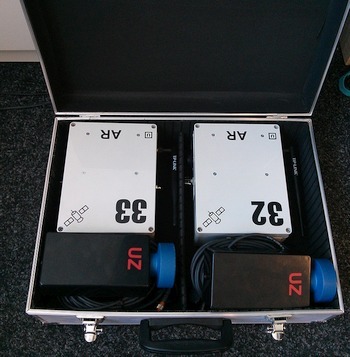 The system is designed for operation in environments with a methane explosion hazard. 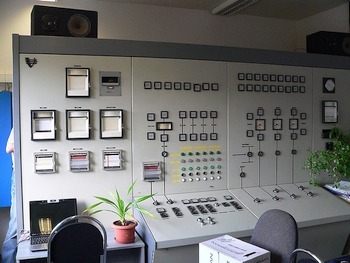 The device controls a cascade of three pumps of 135 kW along with a filtering station, and other support circuits. 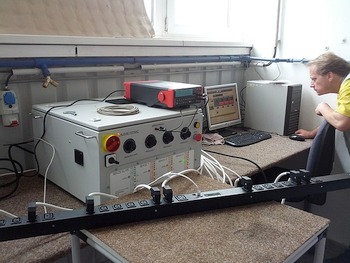 The control system is distributed, the CAN-BUS is used to connect components - thus ensuring substantial savings in cabling, improved diagnostics and improved reliability, which proved very useful in severe conditions of Ukrainian mines: the main communication line has four conductors, compared to around one hundred in older devices. The color display of the central control unit shows the operation status, failures, pressures and status of individual systems. 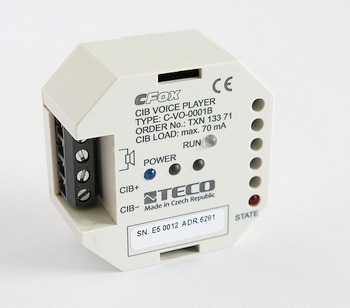 Sound module for intelligent buildings systems developed for Teco company based on their systems (PLC Foxtrot, CIB). 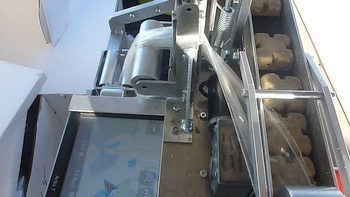 The module is fitted in an enclosure to be mounted into wiring boxes. 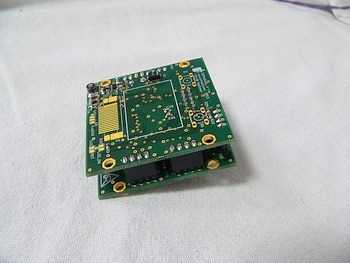 The module contains an internal audio power amplifier with volume control. We have implemented a system for collecting measurement data from the dam pendulums at The Vír Dam - one of the largest dams in Moravia. Special electromechanical sensors, developed by BVT Technologies, are activated by our systems every half hour to perform position measurement of the dam pendulum. The measured data is transmitted via communication line to a collecting unit with a memory buffer placed in the control room of the dam. 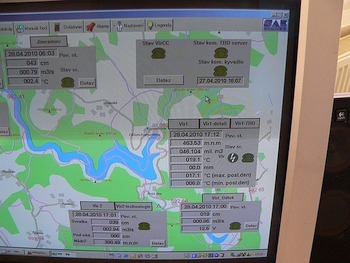 This unit transmits the measured data into the information system of the river basin supervising company. 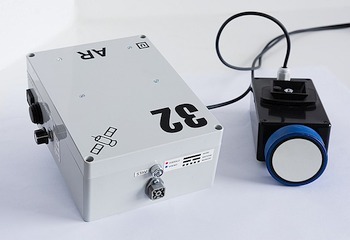 The unit emulates a protocol of an original device from the 90s, while at the same time the data is stored and made available on a web server for remote control. 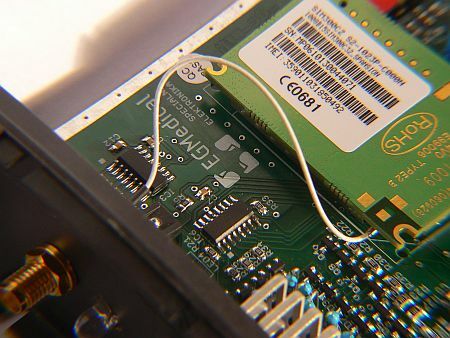 The device is also capable of an emergency communication using the GSM module, particularly in case of failure occurence. 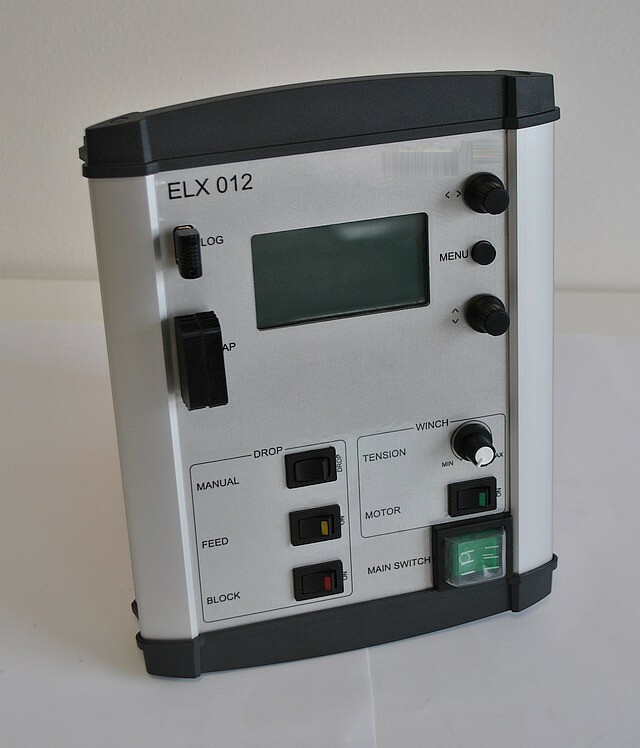 The pulse generator is usually used as a sequencer to trigger other devices - typically for triggering measurements or modifying an experiment in the specified time sequence. 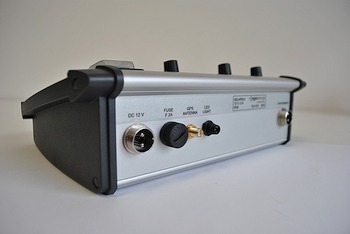 The developed device generates digital pulses with adjustable width and time delay (from 10 ns to 1000 seconds) for up to four outputs. The generated sequence may be triggered manually, automatically or can be triggered by an external signal. There are also complex output modes, such as formation of combined pulse trains, skipping pulses at a specified ratio etc. The basic time resolution is 10 ns. 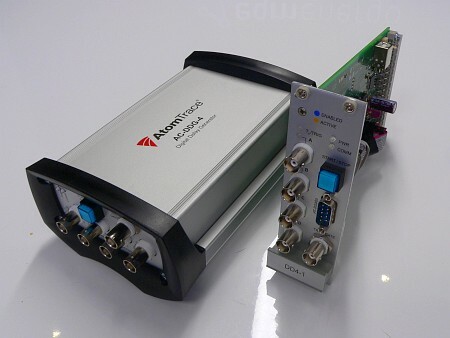 The device is designed variously as sub-rack card or as a stand-alone box. 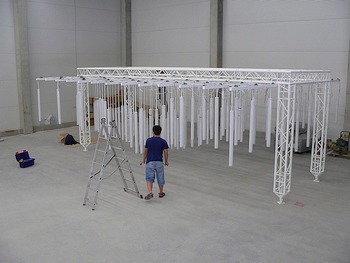 Interactive light installation of the Vysocina Region for Expo 2015 - 'Let there be light', consisting of about one hundred tubes with twice as much special reflective sensors that illuminate the tubes according to the movement of visitors. 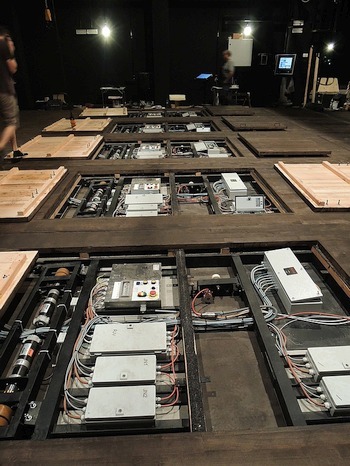 Complete electronic equipment for battery-powered revolving stage and side wagons for musical theater Capitol in Wroclaw (PL). The device provides two-channel secure wireless control, automatic and accurate arrival at the desired position, battery charging control with automatic rechargers and advanced system diagnostics. 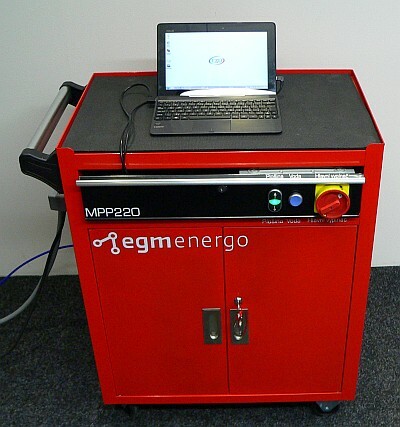 The device allows charging and discharging of cells or batteries in the range of 0 to 20 V, 2.5 A. 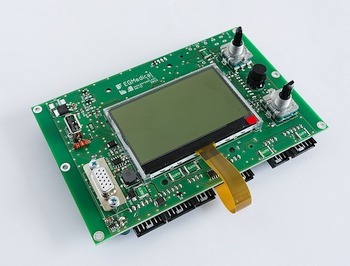 The device consists of an electronic load together with precise power source with limitation of current and voltage. 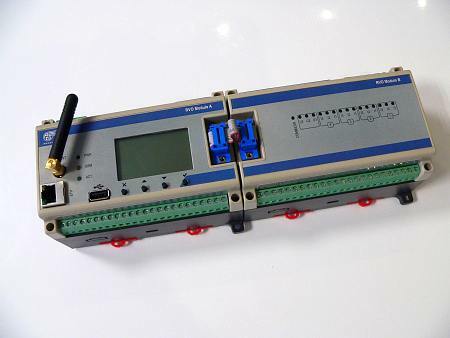 The device is controlled centrally via Ethernet from a software control center, created in ControlWeb system (communication protocol is documented). 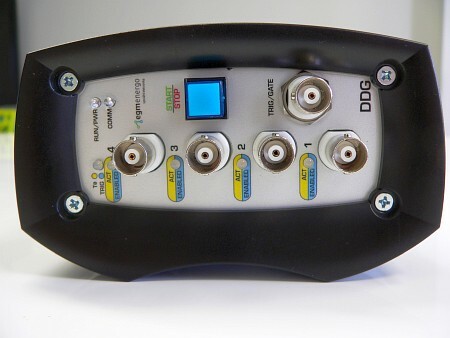 The device has three inputs for additional measuring equipment. The accuracy of measurement is in the range from 0.1 to 0.3%. More advanced MUP-3 is equipped with a pulse charge and discharge in the range of 4-20 A. 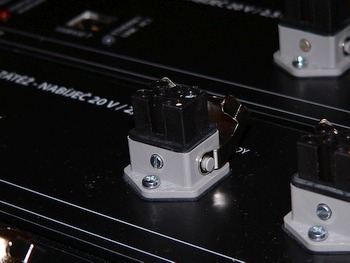 The measuring cycles can be controlled by the internal sequencer with a resolution of milliseconds. 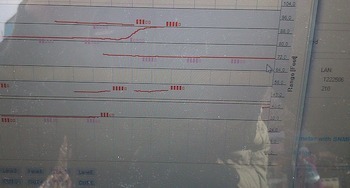 The sequencer is programmed using scripts in C language, it is able to manage even complex measurement procedures depending eg. on a mathematical model of the connected battery or modify parameters for charging or discharging according to the actual measured values. 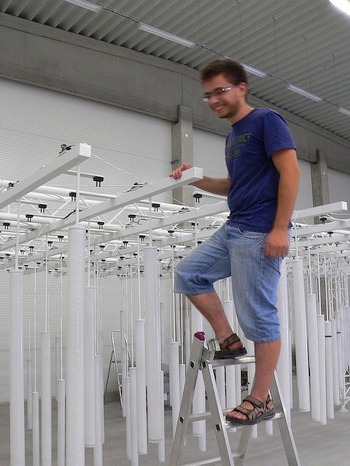 Construction of complete measuring workplaces with our devices is provided by the company Interal, Ltd. Ostrava. Further information about chargers - vybíječům: programmable charger - discharger. 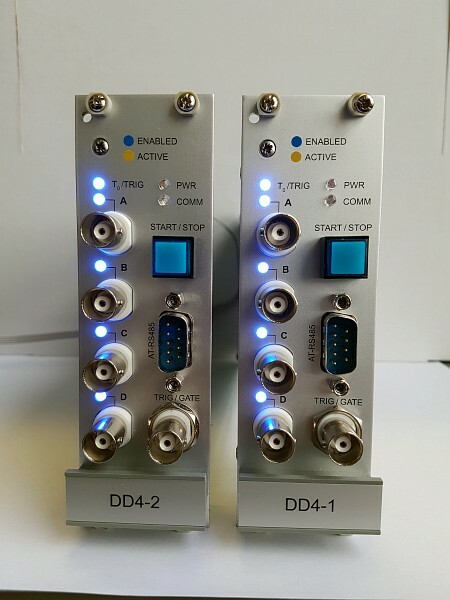 The device is intended for load testing and final inspection panels of PDU (Power Distribution Unit) panels used in data centers. 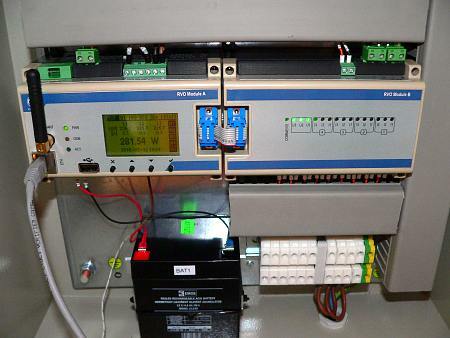 The device is based on a principle called the transformer load: the device's individual circuits are loaded with high currents simulating current consumption of tens of kW, but the total consumption of the device is low, in normal operation up to 500 W. The device is controlled by a computer. Tests carried out are precisely documented in the database, part of the test protocol is saving the protocol and printing a nameplate. 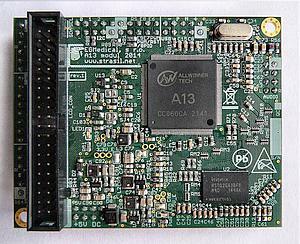 Computing module with microprocessor Allwinner A13 1000 MHz / 256-512 megabytes of RAM (DDR3) including interface for the touch screen, USB, LAN, audio and others. 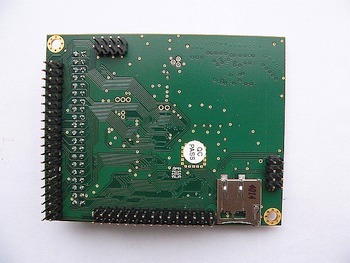 Simple and cost-optimized four-layer board for implementation of various control and communication tasks. The device runs a full-featured Linux OS with a graphical interface if necessary. On this platform we realized eg. 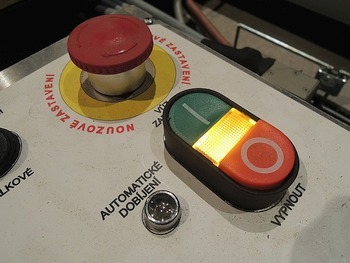 a control unit for turnstiles at stadiums and tourist attractions. 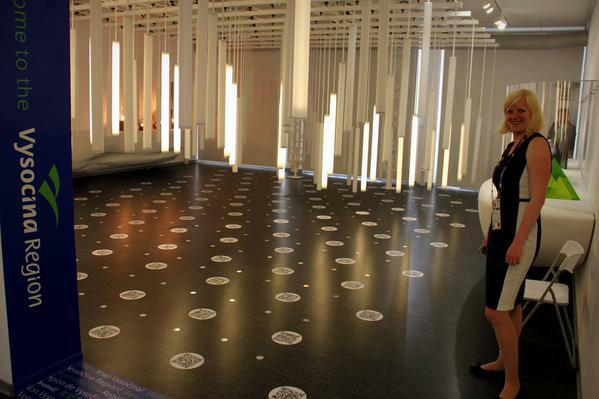 The device is inserted into climate chamber, which ensures a constant temperature and humidity of the ambient air. 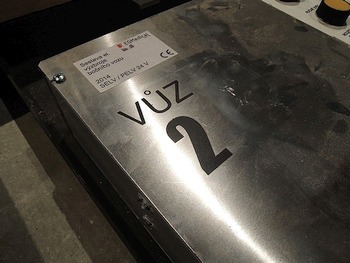 There is a a special heated, partially water-vapour transmissive plate inside the device. The plate is automatically moistened and heated and thus simulates the properties of sweaty skin. 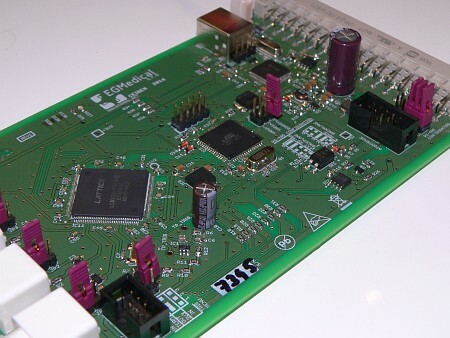 The board is mounted on an electrically positionable platform and is thermally shielded by electronically controlled thermal protectors. The surface of the board is exposed to partially turbulent flow of air generated by tangential fans. Speed of air flow and its dynamic changes are evaluated electronically in a feedback control loop of the fans. The heat loss of the fabric (thermal and evaporation resistance) is calculated according to the energy consumed to heat the plate. 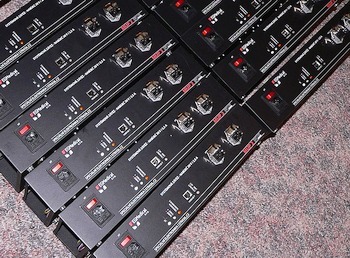 The equipment includes a control computer and power supply cart. Device runs Windows OS. 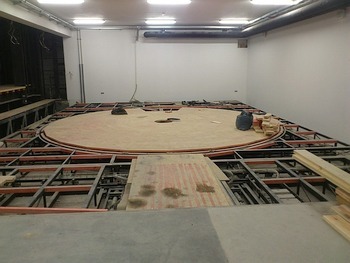 Indicative price: $ 15 000 to 25 000 incl. worldwide shipping and installation. Bearings temperature alarm for the main rotor of a gyroplane. The device detects excessive heating of a rotor bearing comparing it with the ambient temperature, in case of danger an audible and a visual alarm on the OLED display is triggered. 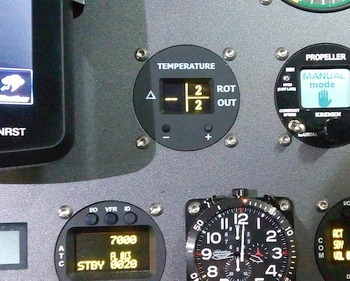 Similarly, the air temperatures outside the permitted range of the gyroplane's operating conditions are indicated. 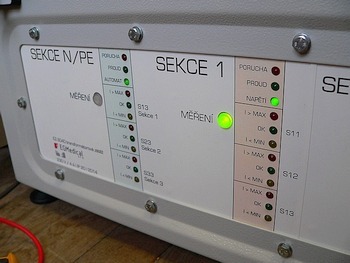 An audible alarm signal is connected to the circuit of external receiver input; a warning message can be announced in Czech, English or German. Alarm Volume is adjustable.